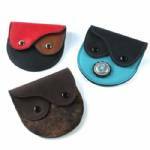 Leather coin purses with two compartments. Each compartment has its own snap-closure flap. The overall size of this item is about 4" wide, 4" tall, and 3/8" thick. Upper left: Smooth leathers in red, brown, and black. Upper right: Smooth black and turquoise leathers with silver and turquoise concho. Bottom: Smooth brown leather with brindle hair-on cowhide.